Generally speaking, the bass channel in a track should be in mono: most subwoofers (not to mention club soundsystems) play a mono signal much better than a stereo one. If you’re making an octave bassline, though, or your bass patch has a lot of high-frequency content in it, you may not want to mix the entire channel to mono. 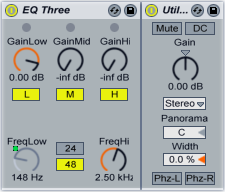 Here’s how to build an audio effect rack in Ableton that allows you to put the lower frequencies in mono without affecting the higher ones. Finally, drop a Utility plugin onto the Mono EQ. Turn the Utility’s “Width” control down to zero. This forces all of the low frequencies in the signal into mono, leaving the rest of the signal’s stereo field unchanged. Start playing the bassline, then turn the macro knob; as you turn the knob to the right, the rack will move the point at which it separates the signal into mono and stereo (for a completely mono bass, turn the knob all the way to the right).